Nick Sousanis' Diss About Comics Written As a Comic Is Now a Book! Great news about one of the participants in our "What Is a Dissertation?" workshop. Here's the announcement of his dissertation--now a book--from Harvard University Press. The primacy of words over images has deep roots in Western culture. But what if the two are inextricably linked, equal partners in meaning-making? Written and drawn entirely as comics, Unflattening is an experiment in visual thinking. 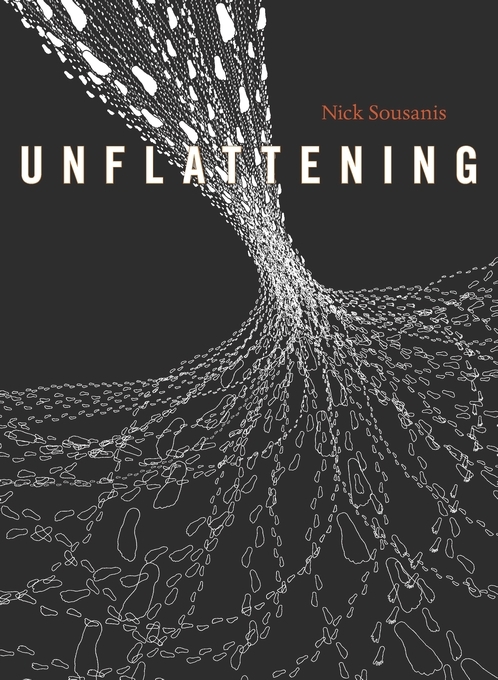 Nick Sousanis defies conventional forms of scholarly discourse to offer readers both a stunning work of graphic art and a serious inquiry into the ways humans construct knowledge. Unflattening is an insurrection against the fixed viewpoint. Weaving together diverse ways of seeing drawn from science, philosophy, art, literature, and mythology, it uses the collage-like capacity of comics to show that perception is always an active process of incorporating and reevaluating different vantage points. While its vibrant, constantly morphing images occasionally serve as illustrations of text, they more often connect in nonlinear fashion to other visual references throughout the book. They become allusions, allegories, and motifs, pitting realism against abstraction and making us aware that more meets the eye than is presented on the page. 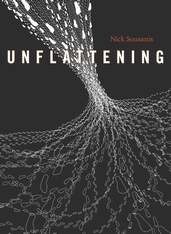 In its graphic innovations and restless shape-shifting, Unflattening is meant to counteract the type of narrow, rigid thinking that Sousanis calls “flatness.” Just as the two-dimensional inhabitants of Edwin A. Abbott’s novella Flatland could not fathom the concept of “upwards,” Sousanis says, we are often unable to see past the boundaries of our current frame of mind. Fusing words and images to produce new forms of knowledge, Unflattening teaches us how to access modes of understanding beyond what we normally apprehend.